Rare? Hardly—the Volkswagen Type 1 is nearly as numerous as the Coleptera order from which they take their nickname, Beetle. A ubiquitous feature of the motoring landscape of the ‘60s and ‘70s, these curvy-carapaced creatures survived well into the modern age, and are still a common sight around the world. To invest time and energy into preserving or restoring a car intended as cheap mass-transportation seems faintly ridiculous. With all the gently rusting metal awaiting rescue in the barns of the world, why chase after a machine that’s already cluttering up museums and car-shows around the world? Unique it may not be, but the Beetle nevertheless has a singular appeal. 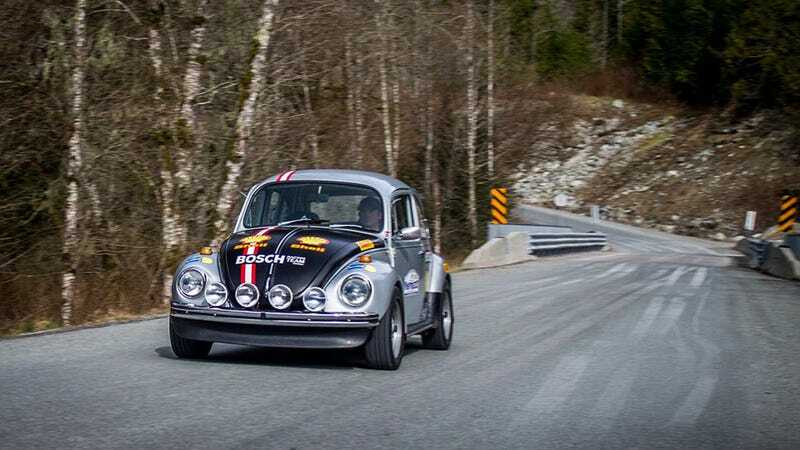 Here, Canadian Dave Hord’s rally-spec 1971 VW Super Beetle 1302S tribute—previously featured on this site—shows us just how special the humble people’s car can be. Hardly anybody isn’t already familiar with the Type-1’s dark, Nazi origin story, its shift from shell-game propaganda ploy, to wartime survivor, to unlikely hero of the counter-culture movement. But delve a little deeper and there’s a near-endless well of stories to be told, from the first knock-down-kits assembled in Ballsbridge, Dublin, to the lunatic, twin-engined 400hp endurance racer driven by Emerson Fittipaldi in South America. Hord’s car is a tribute to one such side-branch of the Volkswagen mythos, the Salzburg Rally Beetles campaigned by Porsche Austria in the early 1970s. Like the ’32 Ford Coupe, the Beetle attracts creative minds who turn them into everything: from art cars to hotrods. Hord’s machine leans toward the latter, and is a mix of period-correct pieces and modern air-cooled know-how. It’s the result of years of planning—and a notebook filled with the scribbled ingredients of a recipe for something amazing. Dave’s car is not quite perfect; if you ask him, he’s already drawn up a mental picture of what he’d do differently next time. However, there are no plans to strip a single thing off this tribute car. Its collection of imperfections gives it a quirky temperament that requires mastery. There are many Beetles out there, but none like this one. With a professionally-built 2.1L flat-four cranking out 150hp, swappable suspension for rally or tarmac, and the dogleg five-speed out of a contemporary Porsche 911, Hord’s rally-Bug goes like a ball-bearing out of a slingshot. It’s a raucous cacophony of rear-engined raw combustion, and with a judicious dab of left-foot braking, it wriggles through the corners with glee. Over multiple decades of production, the Beetle touched many lives; even before Herbie showed up, people loved the Love Bug. Everyone has at least one Beetle story: a college friend who had one, riding around in the back of a car belonging to an eccentric aunt, or a chassis that’s been mouldering away in Dad’s garage for ages. People who don’t get cars can’t help but smile when they see a Beetle, even if they couldn’t tell an oval window from a split. It’s a cultural touchstone, and that joyous air-cooled raspberry needs no translation. This post originally appeared on Petrolicious and has been republished here with permission. Email us with the subject line “Syndication” if you would like to see your own story syndicated here on Jalopnik.